A marine survey, in its simplest form, is an appraisal similar to that performed on real estate or other items. The survey normally provides a complete report on the subject vessel, and references complete identification of the boat (including year, make, model, hull identification numbers, engine information and so on). The report also gives detailed information about the vessel including description of the hull and superstructure, fittings and equipment, electronics and safety equipment, galley (if applicable), engines, electrical system, firefighting equipment, and fuel systems plus any other relevant items. What should I expect in a marine survey report? 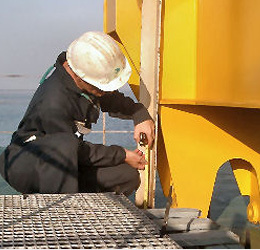 An engine survey is a separate report that specifically reviews the boat's power and analyzes such areas as general detailed description, filters (fuel and oil), fuel and oil lines, exhausts systems, cooling systems, fresh and raw water systems, emergency stop and alarm systems and transmission data. This report should also include compression testing and oil analysis. – An engine is usually being conducted by a specific engine surveyor, who usually familiar with the equipment brand being inspected. You are hiring the marine surveyor for an objective opinion of the condition of the boat and its value. You may not agree with their final findings in either regard, but you have benefited from their professional opinion. The marine surveyor you hire should complete a thorough visual inspection of the boat you intend to purchase. Some nondestructive testing such as sounding the laminate with a hammer, or testing with a moisture meter should be included. You should be aware of the guidelines a marine surveyor uses for his comparisons, such as: "The mandatory standards promulgated by the United States Coast Guard (USCG), under the authority of Title 46 United States Code (USC); Title 33 and Title 46, Code of Federal Regulations (CFR), and the Voluntary Standards and Recommended Practices developed by the American Boat and Yacht Council (ABYC) and the National Fire Protection Association (NFPA) have been used as guidelines in the conducting of this survey." This tells you the exact information the marine surveyor used as a baseline for his comments and recommendations. Also be sure you understand how the marine surveyor determined the market value and/or replacement value for the boat and what those values mean. Do I need a marine survey? If you are intending to invest thousands of your hard-earned dollars in purchasing a boat, a marine survey may be the least expensive and most valuable tool you have to assist you in that purchase. A boat operator who knows the condition of his vessel is better prepared to handle adversity than one who isn't. The marine surveyor you hire to inspect the boat should have the knowledge and expertise to determine if it has been properly maintained and in safe condition. A prudent buyer should make his final acceptance of the boat subject to the findings of a marine surveyor. Should all pre-owned boats have a marine survey? From a boat owner's point of view, you should assess the risk of operating the vessel by having the boat surveyed to determine its general health and that of the operating systems, as well as fair market and/or replacement values. Most marine insurance companies and marine lenders will require a survey be reviewed and accepted (based on the surveyor, the findings in the report, and associated risks) prior to approval of the insurance or loan request. How do I find a marine surveyor?